In addition to traditional-format two-dimensional works, I create larger installation pieces, often intended to be interacted with. These include giant books, arrays of patterns that can be moved or rearraged, and 1-2 m sq ink patterns under perspex so that viewers can draw on them. Below are details of some of these artworks with details of how they are made and constructed. Arrays are collections of many small individual drawings or patterns, on tiles or supports of some kind. When displayed together, the tiles are more than the sum of their parts; they can be moved or rearranged into something else, perhaps as part of a learning game, or for solely aesthetic/fun purposes. I design arrays so that tile materials can be reused where possible/appropriate. 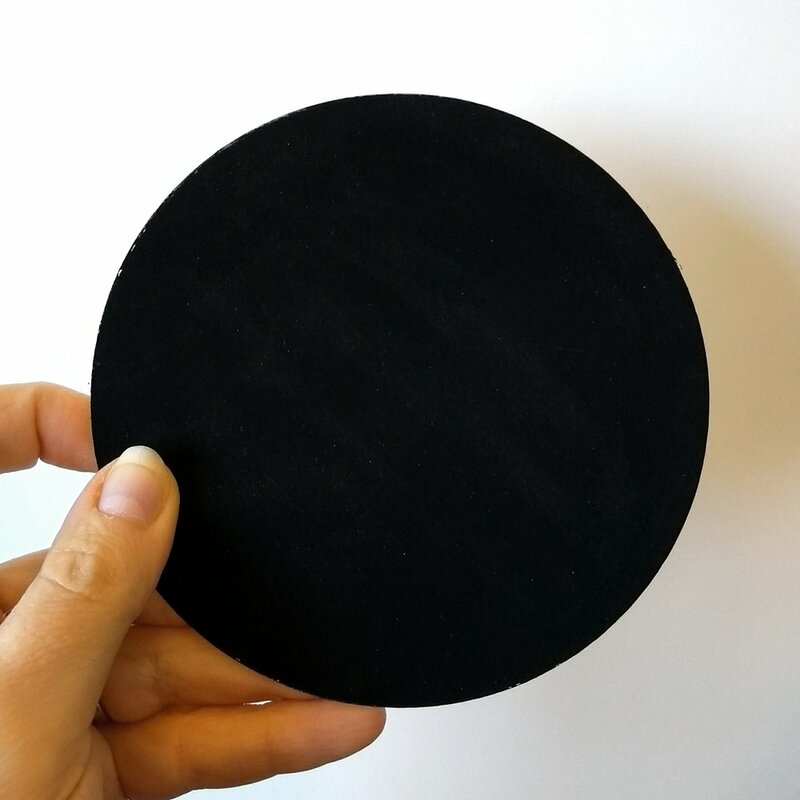 Below are some materials I use to make movable arrays, including perspex circles sanded and mounted to the wall with velcro tape. Perspex has the advantage that it can be cleaned and recycled to make work more environmentally sustainable; for short term pattern displays, I can wash and reuse the same set of tiles many times for different pieces or exhibitions. Sanded acrylic/perspex, and wood circles can also be painted & mounted to walls using magnets or hooks, making this a very versatile method. 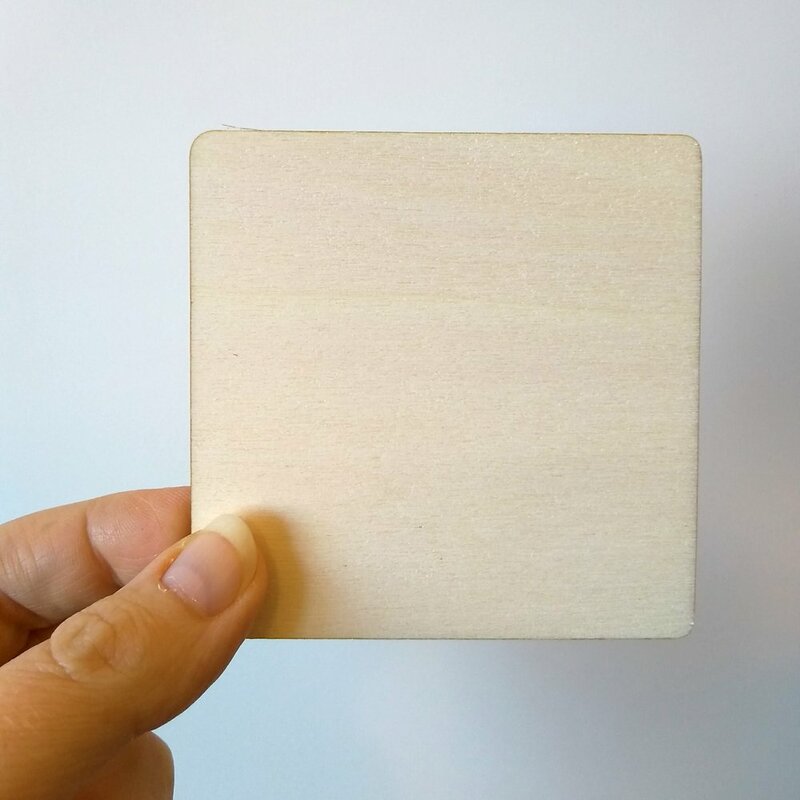 Where tiles from an array will be sold, or permanently displayed, wood and card can be used with archival paint or pigment, to give them longevity. 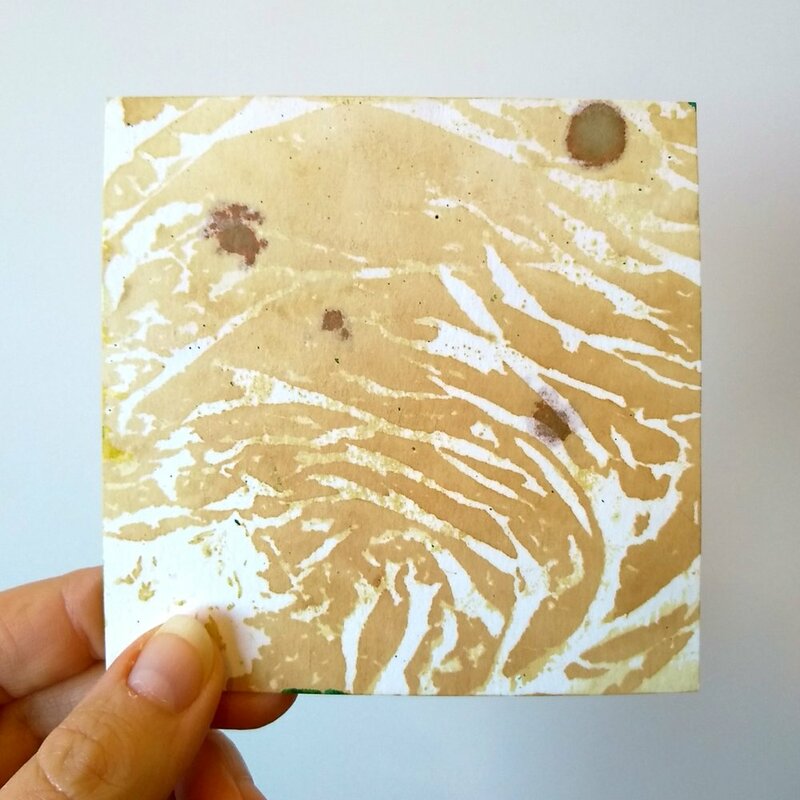 Below is an example of hand-dyed card made by my collaborator Scott Mantooth (USA), similar to that used in the “49 maps of disability body politics” array shown underneath the materials. I make large pattern drawings up to 2 m sq, using a variety of materials. These can be accompanied by visual games, and may be displayed behind re-useable glass/perspex sheets and drawn on by viewers. I particularly like this method of display; drawing over artwork (even when intended) feels mischievous and creates a sense of fun, disrupting the often somber atmosphere of gallery spaces. 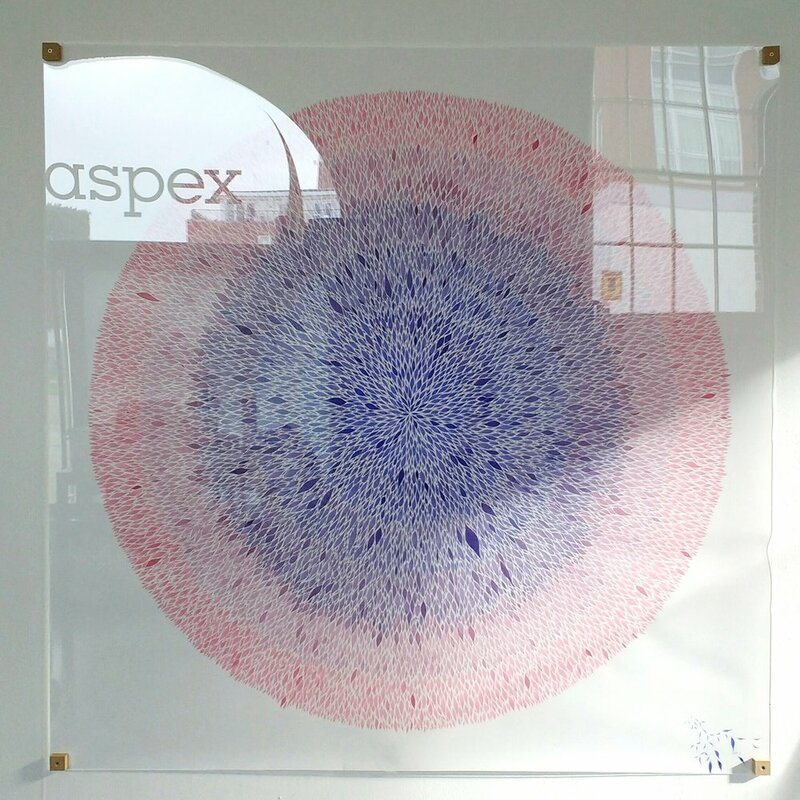 Shown are two of the 1.5 m sq ink patterns from my ‘Connecting Narratives’ exhibition at aspex Gallery in Portsmouth, mounted under perspex sheets. 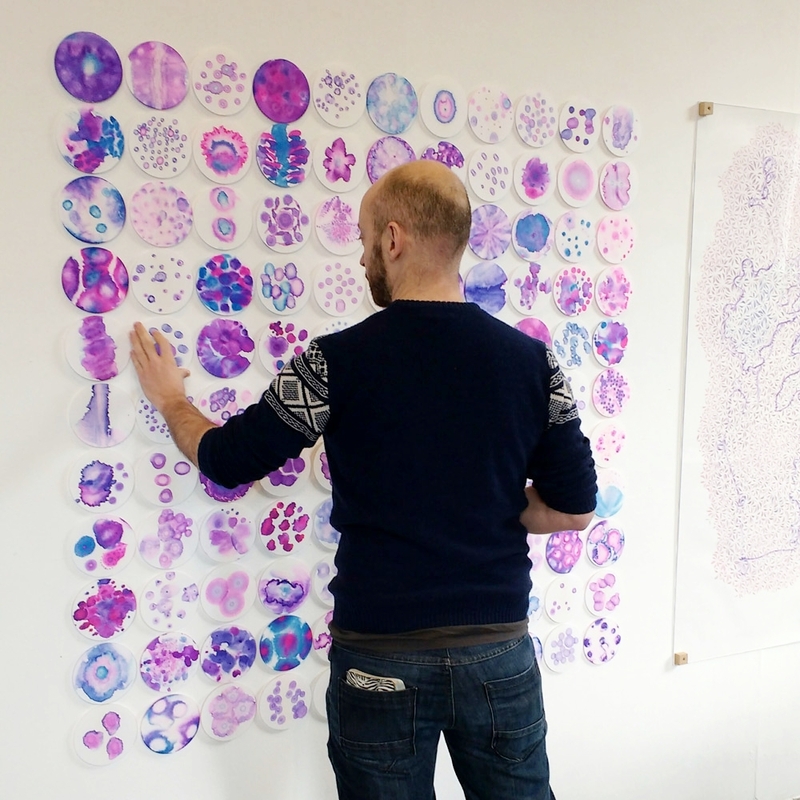 Each is accompanied by a drawing game about a clinical feature unique to brain tumours, and participants drew over the perspex cover sheets with dry-wipe pens to play the games. Below are images of pieces from my ‘Patterns of Mutation’ exhibition at the British Science Festival in Bradford. This included four giant drawings, an ink pattern array, and a giant book, each accompanied by visual games about cellular mutation. Using Morse code as a drawing method, large scale arrangements can be made in ink, paint, or digital formats. These can be installed as single large drawings, prints, arrays for physical rearrangement, or screen displays. Morse code can be used as a visual pattern, and as audio signals. I am particularly keen to use this method of producing images for display in both physical and online spaces, allowing sound and visual aspects of the work to come together. 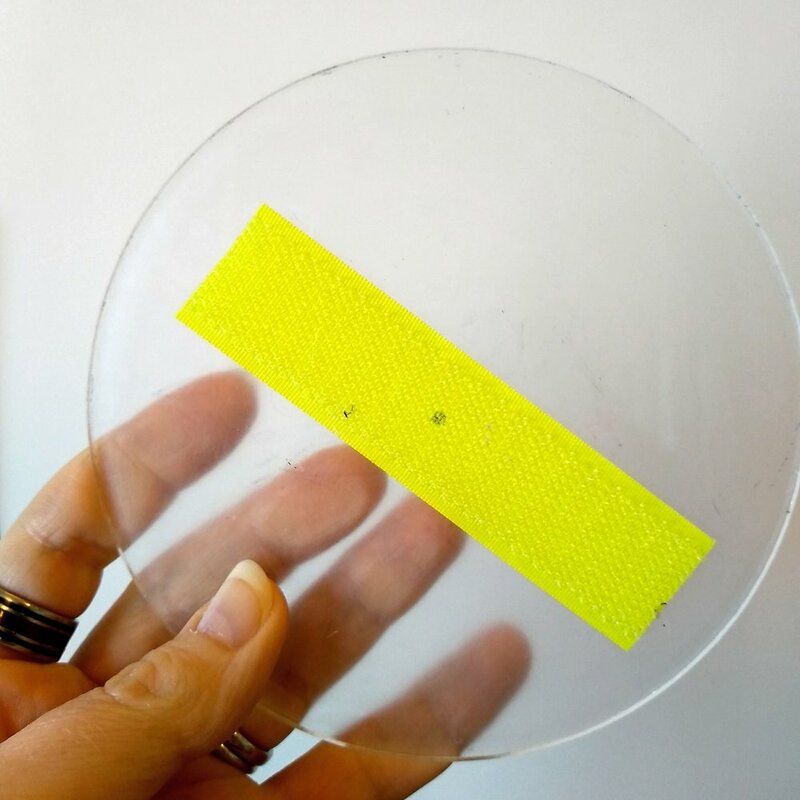 I am also exploring how to make tactile pieces using laser cutting and puff paint; my aim is to eventually produce work that is accessible in visual, audible, and tactile form.